It’s been a while since an Anonymously Me story came to me and it strangely fitted into today’s #FridayReflections prompt of ‘kiss and tell’. 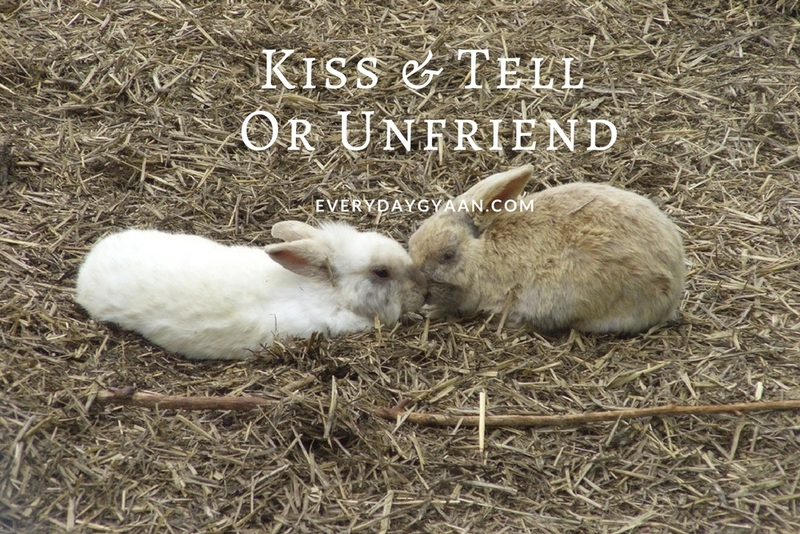 Today’s story, Kiss and Tell or Unfriend, is of a woman in her 40s who lives in the US. Remember those teenage years, when every crush was discussed with your gang of girls almost every day? Then as you enter your 20s and start to move cities, you get together from time to time and discuss your romances threadbare? I started to get a little uncomfortable with discussing boyfriends with my friends as I got older though. It did seem like a breach of privacy – mine and the guy’s. Anyway, I’m going to keep this short and tell you what happened to me. I was in my late 30s, and almost giving up on the chance of marriage, when I met Mr I-Thought-Was-Right. We had a whirlwind romance and then I realized he had no intention of committing to a relationship, much less marriage. But I was too much in love to allow the truth to reach my brains! It’s only when I started dipping into my small savings to pay for our holidays, that he turned into work and borrowed money, he didn’t return, that I took notice. After much crying and self-talk, I sent him a ‘Dear John’ email! Strangely soon after this, I met my now-husband online. We decided pretty soon that we were getting married. Everything seemed destined to be (and it was). I was happy to share the news with my close friends. That’s when it happened. This friend started to give me advice about how I was jumping from one relationship to another – fair advice. But then instead of focusing on my new relationship, she started to keep probing to ask me why I broke up with the ex. All my efforts to tell her that was history that I didn’t want to get into. But she went on and on, making me uncomfortable. Then I began to see the pattern, she reveled in kiss and tell stories ! She found excuses not to attend my wedding, but called a week later to find out if I was still happy!! I refused to kiss and tell. So the only choice was to unfriend her. And I did. When friends start to cross the lines of privacy, it is time to unfriend, isn’t it?